This post is sponsored by Carter's on behalf of Everywhere Agency; however, all thoughts and opinions are my own. 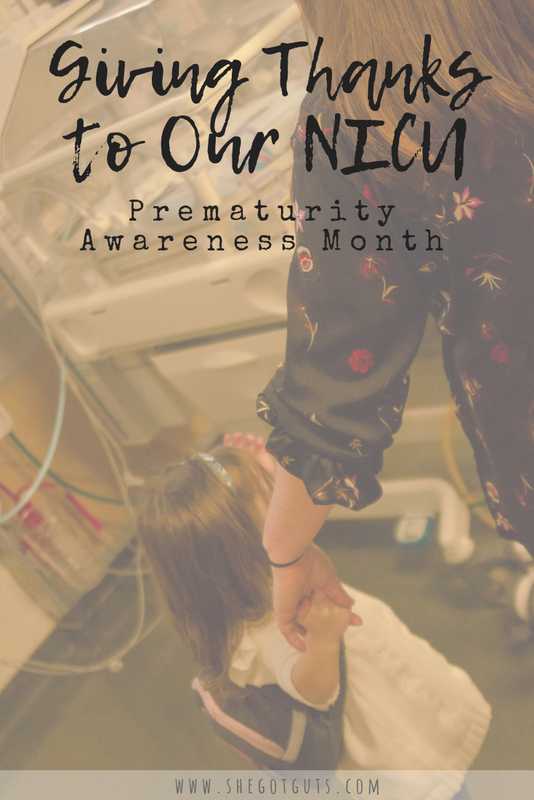 It’s Prematurity Awareness Month, and in true She Got Guts fashion we’re spreading awareness, expressing our thankfulness, and giving back to the NICU that gave us so much. This year, I’ve got a partner who’s helping me out with my mission as a preemie mom to help teach the world a little more about giving birth to a preemie, the truth of life in (and beyond), and about products that actually make sense for their tiny, fragile bodies. I’m proud to say that Carter’s has partnered with me and provided a generous gift to NICU families in support of Prematurity Awareness Month. When I first got pregnant and thought about giving birth (aside from worrying over the typical birthing fears), one thought ran through my head constantly…they would lift her in front of me, place her on my chest, and that moment when we first saw each other, bonding as mother & daughter. I couldn’t wait to see the baby I had fought 3 long years for, through infertility, 5 rounds of IUI, 2 rounds of IVF, and a miscarriage. The thought of that moment is powerful even today, and something I mourned over when Addie was born. She was brought into the world via an emergency delivery, to save both of our lives. I delivered her 14 weeks too soon, because my pregnant body was failing, and it was unsafe for her to bake any longer. Instead of the dreamy moment I’d envisioned when she’d be placed on my chest and we’d stare into each other’s eyes, she was poured over by nurses, hooked up to machines, checked, poked, prodded, and raced out of the room. Straight to the Neonatal Intensive Care Unit (NICU) she went. I wouldn’t see her for 24 hours, I wouldn’t hold her for a week, and I wouldn’t bring her home for over 4 (very long) months. Heart-wrenching doesn't do justice to what I felt. I gave birth to a 26 week old, 1 lb 8oz, micro-preemie miracle. Our journey through the NICU was a rocky one, and has left my daughter with a chronic illness she will deal with for the rest of her life. I can painfully recall one of our scariest days in the NICU. The NICU called, and said that we needed to come in right away, Addie wasn't doing well and we needed to pack an overnight bag. When we got to the NICU, there was a crowd in her corner and the cover was off of her isolette. As we approached, we saw their long faces. They gave us a look that almost had an air of sorry-for-your-loss. You could see the worry and concern on their faces. This didn't help. This didn't reassure us in any way. Whenever something has gone wrong up to this point, we've been somewhat reassured because they didn't flinch. They didn't seem concerned. This was different. Addie looked terrible. Her usually pink skin was a greyish-blue. She already had the vent tube down her throat. Her belly was huge and so stretched out that you could see every vein. She wasn't moving. Barely opened her eyes, and only once. She had an IV in her foot and her arm. It tugged at every string in our hearts. And the doctors and nurses told us that this was actually better than she'd looked an hour before. I'm glad we didn't see her at her worst. I could barely stand seeing her like this. It felt like all of the progress she'd made in the days prior came crumbling down, in an instant. ﻿That day, Addie had contracted necrotizing enterocolitis, a life-threatening infection that causes intestinal tissue to die. It's the main reason premature babies die in the NICU — 50 percent of those affected, don't survive. But Addie did. And with a mascara-stained tear streaming down my cheek, I finally held her, after 7 days of worrying whether she’d still be with us. Whenever I revisit this moment in my brain, I hold on to her a little tighter. Through all of the hardships, there were some things in the NICU that helped us feel a bit more like a regular family. Things that may seem so run-of-the-mill when you give birth to a typical newborn, are huge milestones with a preemie. One of those milestones is when they can finally wear clothes. Preemies have difficulties regulating their body temperature, so until they can do that they need to stay inside the toasty, warm isolette. We waited nearly 3 months until Addie was able to wear clothes and when she finally could, it was a big day! Dressing her was also one of the few mom things I could do for her. There were so many cares that I had to rely on nurses and doctors for, but dressing her was something I could do and something I insisted on from the moment we were given the go ahead for clothes. Having a small moment of control and care for your baby in an environment where very little is in your control, goes a long way. From day one of being told she could be in clothes, I packed her corner with tubs and tubs of the smallest baby (or sometimes doll) clothes I could find. She was known for her NICU fashion and most notably for the bow that was always affixed to her tiny head. 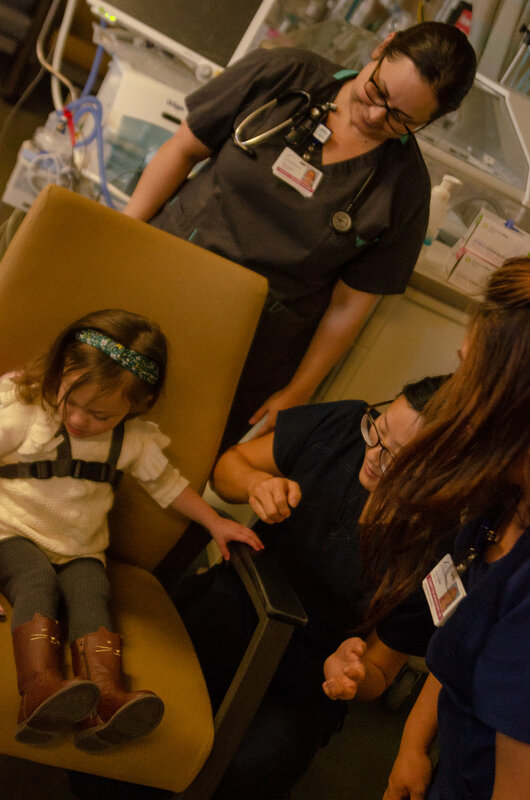 We share because stories like this are a huge part of the NICU journey. It feels like part of the reason we went through it is for us to share our story, to spread awareness, and to connect with families so they feel less alone. I am also an extremely proud mama bear who is not afraid to brag about her miracle child who fought for her life and defied the odds again and again. It was a no-brainer to Partner with Carter’s to give back to our NICU and support Prematurity Awareness Month. Spreading awareness can be a first step toward changing behavior, to influence someone to help the community that often goes unheard. Awareness leads to advocacy, volunteering, donation of blood or breast milk, financial assistance, consideration of this population when creating products, or even policy change. One thing we love more than anything is to give back to the Sinai NICU who gave us our child, who took care of her 24x7 (since they wouldn’t let me just move in), and who saved her life more than once. Carter’s provided gifts to support all of the families at my hospital, including gift cards, blankets, and bodysuits in preemie and newborn sizes and a card for each family. In each card, I told the family’s we spent 114 days in the very same NICU, that we “get it” and sent them hugs and love. I would have loved to get something like this while we were in the NICU, a gift Adeline would need and use. We took her to the NICU to deliver all the generous gifts from Carters . Lately, Addie has been so curious about premature babies, we’ve been reading books, talking to her about it, showing her photos of herself when she was in the NICU, all in preparation for this visit. She was thrilled that during our NICU visit that she got to meet a preemie (her parents gave us permission to see the baby close up). It was incredible for her to see where she lived for the first few months of her life and for her to see a baby just like her . Adeline’s day was made and she impressed the nurses with her medical knowledge. She walked around the entire unit trying to see each baby, and identify the various medical equipment she saw. Going back to the NICU is such a mixed bag of emotions. Seeing the parents sitting next to their isolette, reminds me of how it felt. Walking down the hall and ringing the bell feels like we're coming home in a weird way. Seeing all her nurses, is like a family reunion. When we showed Addie her little corner of the NICU, I was reminded of how much I just wanted to bring her home. How I begged the universe to let me bring her home and be her mother. 1-in-10 babies in the United States are born prematurely and to continue to support those parents, Carter’s expanded its preemie line offerings to include a new collection with new features for babies in intensive care. Their new preemie line was inspired by working with preemie heroes - the NICU nurses. They got feedback from the Northside Hospital-Atlanta’s neonatal intensive care unit to add more features. When Addie was in the NICU, she wore Carter’s outfits in the preemie sizes and they’ve always been the trusted brand for preemie parents.. Adding a new smaller size option (for babies up to 5lbs). Even the smallest of newborn and infant sizes are like giant muumuus on preemies, so having a smaller size is huge (pun intended). Plastic buttons & velcro sleeves so that clothing can be worn during X-rays and to enable easier IV access. You never realize just how many baby clothes opt for zippers until you’re trying to figure out how to thread the tubes and wires that adorn a preemie through a zipped-up onesie. Buttons & velcro are where it’s at. Typically, when you find a small enough size for your preemie, you’re limited to plain white or something that just doesn’t make people go all doe-eyed over your little one. More styles is an A in my book. Also comes in up to 6 lbs & newborn sizes. As your preemie grows, they might still need to spend time in the NICU, so having a collection that can grow with your child is awesome. Nothing says cute baby like a screen-printed catch-phrase on their chest. The Carter’s preemie line is now available in the preemie shop on carters.com and in select retail stores.